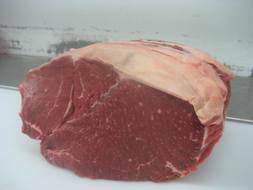 This particular cut is called boneless cross rib in Canada, however in the United States in many regions it is known as boneless shoulder pot roast recipe. The cross rib which sits just below the blade on the chuck and above the brisket is a leaner cut than the blade but still very flavorful and many prefer the cross rib over the blade when cooking a chuck roast recipe. The chuck muscles are heavily exercised and contain a lot of connective tissue and must be slow cooked at a low heat. A shoulder roast will be tough, stringy and very dry if not cooked with liquid. 1. Adjust oven rack to the middle position and heat oven to 300 degrees. Season the roast generously with salt and pepper. 2. In a dutch oven or stock pot heat 2 tablespoons of oil on medium high heat. Brown all sides of the roast about 8-10 minutes in total time. Remove the roast from the pot to a plate. 3. Reduce the heat to medium, add chopped onions, celery, garlic or any of your favorite seasonings, stirring, until beginning to brown, 5-6 minutes. Stir in a 1/4 cup of liquid(such as beef or chicken broth, red wine, soup, canned tomatoes, water or any combination of these) scraping the bottom of pan with spoon to loosen browned bits. Return roast back to pot and add enough liquid to come halfway up the side of the roast. Cover with lid, bring to a simmer over medium heat and then transfer pot to the oven. 4. Cook, turning the roast every 30-40 minutes for 3-4 hours, until fully tender and a meat fork slices easily in and out of the meat. The last 30-45 minutes of cooking, small potatoes, sliced carrots or sliced parsnips can be added if desired. 5. Transfer the roast from the pot, tent with tinfoil 15-20 minutes before carving into ½ inch slices. Allow liquid in pot to settle about 5 minutes and skim fat off the surface with a wide spoon. Season with salt, pepper or ¼ cup of dry red wine if desired and boil for 5 minutes. Use a slotted spoon to remove vegetables and pour sauce over the meat. A very easy pot roast recipe that will have your family asking you to make it again.